Plumbing pipes assessed in all properties. Wiring can be a safety risk. Our inspectors climb into the roof. The roof tiles in this house are deteriorated. Totally independent reports - we have no affiliations with anyone. 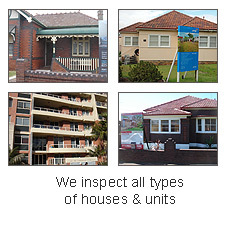 Our inspectors are licensed builders and licensed pest inspectors. Since we are concerned about the health risks of asbestos, every pre purchase building report now includes an asbestos identification section at no additional cost.